Most battery manufacturers specify battery life expectancy in terms of number of cycles at a certain maximum discharge level. Transforming this data into the expected or remaining battery life for a house bank is challenging. In measuring the number of cycles, for example, what depth of discharge qualifies as a “cycle”? Our house bank consists of eight Lifeline 8D batteries. Lifefline reports their batteries are good for 1,000 cycles at no more than 50% discharge, but nearly all batteries go through a few episodes of super-deep discharge where someone forgets to start a generator, is away from the boat longer than expected, a shore-power cord is inadvertently unplugged, or a shore-power pedestal breaker opens. With breakers increasingly sensitive to even tiny current leaks, we expect accidental battery discharge to become more common. 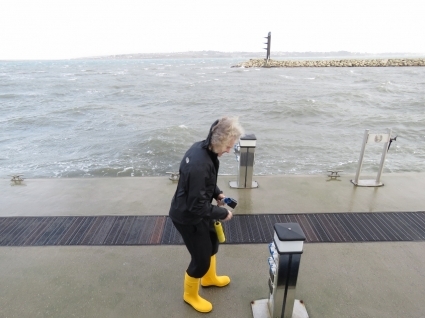 For us, we went way more than 10 years never having seen a dock power problem, but have seen five or six breakers pops this year due to water intrusion either from heavy rain or the waves rolling over the shore-side power pedestals. Our first set of batteries went four years in very heavy use, but as expected, a couple of deep discharges occurred. On the next set, we started an experiment where we did one thing better for the batteries and one that was worse. On the better side, we have a charging, monitoring and automation system that prevents any deep discharges and records battery state throughout their life. This second set of batteries has never been discharged below 50%. We waited four years to see how they did. To confound the experiment somewhat, we started running the boat as a condo and just use the power and live life as though we were always on the grid. This drove up the cycle count per year dramatically. We have spent the last four years mostly using 16A shore service. And the way we run the boat, our peak draw is way over 16A and sometimes during waking hours is more than 16A (laundry on a cold day while heating the boat). This means we often are cycling the batteries even when at the dock. The experiment on the second set of batteries was completed in UK at the beginning of 2018, where we replaced that second set. This battery bank had the advantage of better care, but far more cycles, and it also lasted four years. Depending upon how you count, we had 1,500 to 1,600 cycles on these batteries. As long as the batteries are well-cared for and there are no mechanical faults, as the cycle count climbs, the capacity decreases but they otherwise operate unchanged. The capacity of these batteries just kept declining and when we replaced them they were still doing fine but the capacity was down to one third of the rated capacity. The decreased capacity is apparent in the table below, showing the first few rows of our power state report for while we were at anchor shortly before (left) and after (right) replacing the house batteries earlier this year. 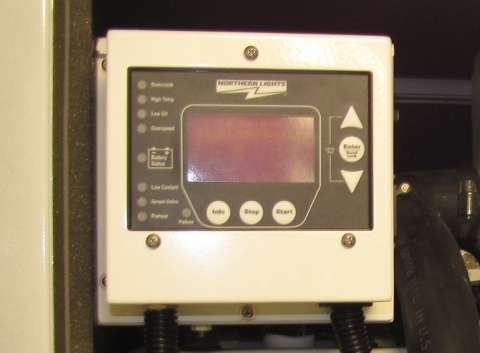 Our autostart system starts the generator when the batteries fall to 55% charge and shuts down at 85% charge. Even if we hadn’t noticed it ourselves, the report makes it clear that with the reduced-capacity batteries, the generator was running more frequently and for shorter duration than with new batteries. The table below summarizes the run statistics across the two anchoring periods. With the old reduced-capacity batteries, the generator was running roughly every two hours for an average charge period of only 1 hour. With new batteries, the average time between generator runs increased to 6 hours and 25 minutes with an average charge period of 2 hours and 4 minutes. From the above table you can see that we’re running less efficiently on the old batteries compared to the new. 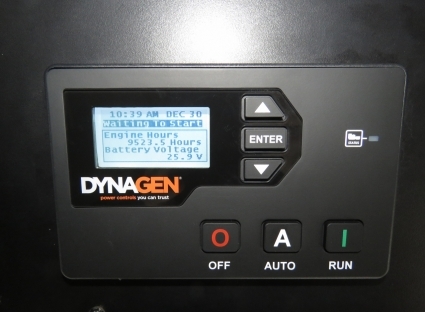 The generator produced 41.9 average daily kWH on the old batteries, versus 30.4 on the new. And it was running more, on average 8.4 hours per day compared to 5.2 on the new batteries. But from a livability perspective it really wasn’t noticable. The generator didn’t feel like it was on more often than usual and everything else just worked the same as normal. Why run the battery bank up to 1,500 to 1,600 cycles rather than the manufacturer’s estimate of 1,000? The easy answer is that at retail price an additional year is worth $1,800. But another factor is with auto-start the reduced bank capacity of older batteries is hardly noticeable. The generator can run infrequently for 2 hours or very frequently for 1 hour. And even with the old bank desperately needing change, the generator is simply running more and otherwise not causing us any inconvenience. While we were anchored at St. Margaret’s Hope shortly before the recent battery bank replacement, we made two day-long trips to Neolithic Orkney and Stromness and were perfectly comfortable leaving the boat during those periods. Deep discharges are hard on batteries. But based upon our first bank’s life, with multiple deep discharges, and that of the second, with no deep discharges, it appears that one or two deep discharges isn’t a big deal. We suspect four to six probably is, but that’s mostly speculation at this point. We’re hoping our current set has no deep discharges over their entire life. We are very dependent on auto-start to maintain the battery bank in good condition and to relieve us from the responsibility of always being there when charging is needed. A well-designed auto-start system will shut the generator down if there’s a mechanical problem and, of course, it’s possible the generator might fail to start. At retail price, our battery bank is worth $7,200 USD, so protecting this investment is pretty important. We have indicator lights, alarms, and email notifications if a control system or generator ever fails, but the most reliable defense is a second generator with an independent auto-start system. We didn’t have space for a second generator, but the main engine is capable of delivery 9kW of power, so we put auto-start on it. Effectively we have a 12kW generator and a 9kW emergency backup, both provisioned with autostart. Abuse like deep discharges or improper charging can destroy batteries in far less than a year. If you can avoid that, then cycle count and depth of discharge is what drives battery life. The cycle count failure mode is usually a slow and steady reduction in bank capacity rather than anything suddenly needing to be changed. 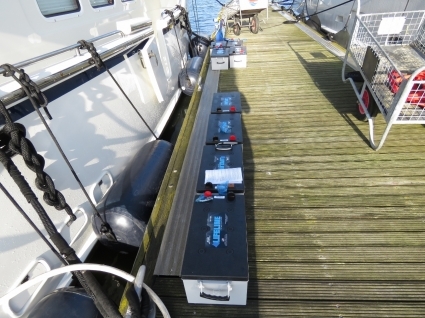 Because we live on the boat year-round and are often at hook or plugged into low amperage services, we wind the cycle counts very quickly and 4 or 5 years of battery life is where we end up. I suspect a more typical usage mode with good care could easily yield 8 to 10 years. Telco backup batteries are rarely cycled, usually well-maintained, and they can last 20 years. 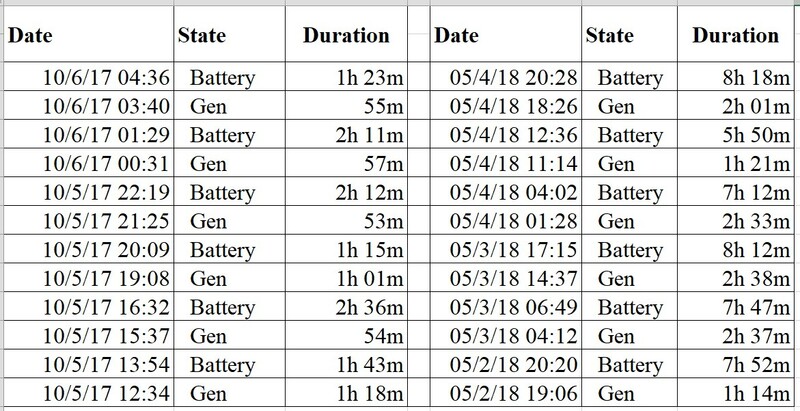 Are you doing regular conditioning cycles with these battery banks? I would assume you are and if so are your chargers set up for this? Also do do you have any procedure for monitoring the batteries while conditioning? We run Lifeline AGMs and, yes, they do need to be equalized (Lifeline calls this process conditioning). The Lifeline recommendations for equalization have evolved over the years. They used to recommend regular conditioning but they now recommending doing it “when the batteries are showing symptoms of capacity loss due to extended time in partial or low state of charge condition.” When batteries are used for a longer periods at anchor, they aren’t getting fully charged and are just being cycled down to 55% and then charged up to 85% again. Overtime battery capacity is diminished and can be restored by a controlled overcharge. We do this rarely because we think it stresses the batteries but will do it every 3 to 6 months depending upon how we are using the batteries. When equalizing, I shut off the alarms and warnings on high battery voltage and extended bulk charging warnings and configure one of the chargers to charge at 31V. The battery overtemp alarm is still enabled since thermal runaway is a risk all the time but especially during equalization. I also shut off any components that may not like getting 31V during the equalization. We like to do this while we are on the boat but during the day so we can keep an eye on them. After 8 hours, I switch on any 24V appliances that were disabled, set the charger back to normal, and re-enable the battery protection alarms. I have certainly noticed the improvement in performance after conditioning a battery bank. I also wonder how often you check the individual voltages of each battery? Do you worry about one cell going bad and drawing down the bank? Possibly your battery management software can detect this?I have encountered this before and changing one battery saved the early demise of the whole bank. Your list of isolating components is interesting and got me to wondering if you have a procedure or list of some kind you refer to for these types of jobs? Yes, a single cell failure is a common battery failure mode. If you buy single cell batteries as is common in the Telco industry, then you can measure each cell and replace them one at a time. With a 12V Lifeline we have 6 cells bundled together in a single package where individual cells can’t be tested or replaced. You can test entire batteries and detect a bad cell with fairly good accuracy but the entire battery is the replacement quantity. In our case, it’s 1/8th of the bank rather than 1/48th when replacing a single cell. Since we run pairs of batteries in pairs to make 4x 24v groups, if one cell fails, it’s likely to take out the entire 2 battery group and you would need to replace both of the batteries in the 2 battery group. So, if we measure and detect this failure mode, we can replace 1/4 of the bank rather than the full bank. This is still a substantial savings but, as the batteries age, we end up more and more likely just to replace the entire bank. Since Lifelines are quite reliable and seldom fail in the first two years and, once we have 2 years on them, we would likely just replace the entire bank. Where this took me is the time and hassle of testing doesn’t feel worth it. 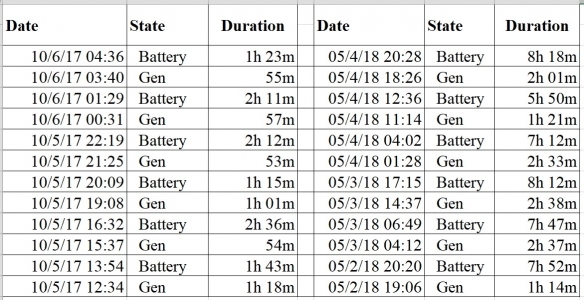 We monitor the full bank at a high level and I get a daily report on battery cycle times. The charge time and the run time shouldn’t change materially day-to-day. If we see an anomaly I can investigate in more detail. I think there is a very good chance we would notice a cell going bad using our full bank monitoring but no longer do manual individual battery measurements. I’ve been following your trip almost daily for a long time. You’ve been writing nice advices / comments to blog readers. One thing, I just wanted to remind everyone is that battery temperature is affecting to the life of battery. Ambient temperature and the temperature of the battery are not the same. You can chance ambient temp quickly, but there is a lot mass (lead) in batteries that is difficult to cool down. Every time you load or charge batteries there is ” internal heating on”. Most of AGM Deep Cycle battery suppliers mention, that rated temperature is 20C or 25C. When temperature is rising 10C you will “loose” 50% of cycles. 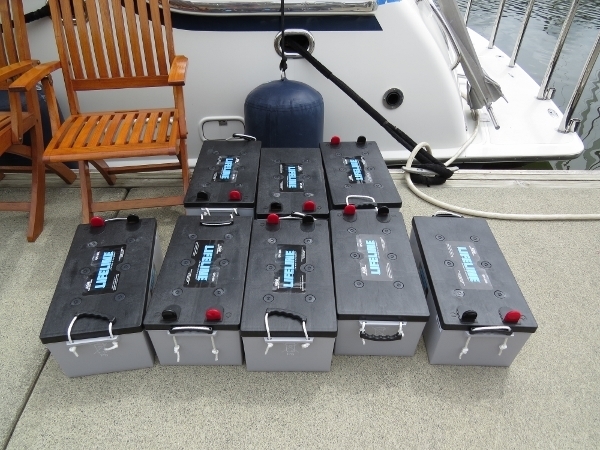 Now when you are cruising in Norway and water is “cold” always so batteries are lasting longer. For the blog readers; there is good battery manual on Lifeline web pages, pls check Lifeline Manual 5.8. Temperature Considerations. The battery are stored in the lazarette and it runs a steady 70F to 80F in Norway and 90F to 100F in the tropics. The battery temperature variability isn’t that great on our boat. I was just wondering if you did consider Lithium Ion technology as an alternative to AGM when you replaced the battery bank this winter? What got me thinking about it was your comments on number of cycles, and the fact you charge the batteries when at 55%. If one believe that LiIon batteries can be drained a lot more and cycled more times, the economics might not be too bad? I assume LiIon would require less space and weigh less, which could be a good thing. I suspect you have given this some thought, and it would be interesting to learn about it. Li-Ion is lighter, can be discharged far lower, and consequently a smaller capacity bank can deliver the same capacity. But changing battery formats is a big change where the physical battery storage need to be changed to accommodate the new battery format, the engine charging system needs to be set up for Li-Ion, Li-Ion packs a higher power density so additional safety systems are worth considering, and the chargers need to be reconfigured as well. The referenced article above gives a good perspective on the work required. Overall, I think Li-Ion is now a good choice but, as a retrofit, it’s more work than I wanted to take on and lead/acid remains a solid and well proven reliable technology.